Chene a Guillotin is located off the D141, between the villages of Concoret and Tréhorenteuc in the Forêt de Brocéliande. The magnificent oak tree, also known as Chêne d'Eon, is a pedonculate oak (Quercus Robur). It is 20m high and has a circumference of 9.65m and is nearly 900 years old! Experts indeed worked out that 'it was born' in 1144, during the reign of King Louis VII, the first husband of Eleanor of Aquitaine, and at the dawn of the Second Crusade. The old bark full of convolutions, knots and holes seems to tell its story and that of its village. If you look carefully, you might indeed discover the face of an old man formed by the folds of the bark. The Chene a Guillotin now stands on the edge of a vast meadow. However, the surrounding pastures didn't exist when it was a sapling, as the Forêt de Brocéliande covered most of the area. 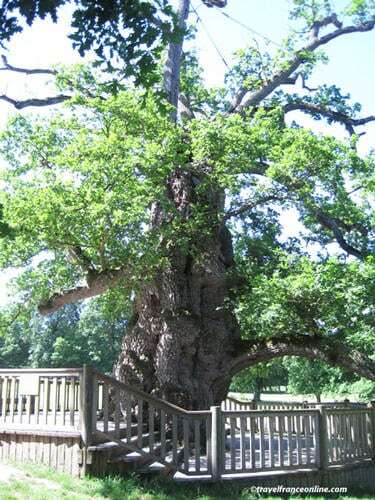 A wooden platform today surrounds the majestic oak in order to protect its immense branches. Wooden poles prop up some of them, as it feels the weight of years. The oak was originally known as Chêne d'Eon. The hermit Eon de l'Etoile indeed lived in this enclave of the Forêt de Brocéliande. 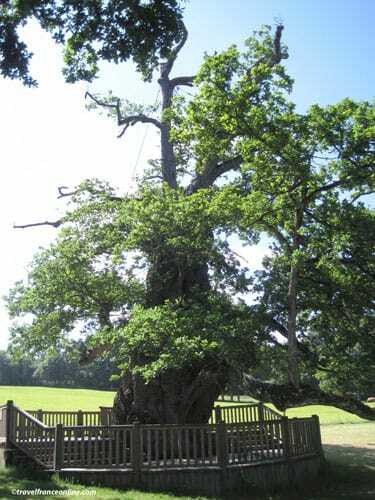 This was 900 years ago, and the venerable oak was then just a young sapling! Legend has it that Eon suddenly turned mad and sudenly became the leader a band of outlaws. Together they roamed the dense Forêt de Brocéliande, where they robbed and killed travelers. However, Eon the failed hermit, was eventually caught! He ended up in a squalid prison in the city of Reims in Burgundy. The tree was renamed Chene a Guillotin during the French Revolution. This has nothing to do, however, with the inventor of the infamous guillotine! It was simply renamed after Pierre-Paul Guillotin, the priest of Concoret, who encouraged his parishioners to fight the revolutionaries. However, the revolution gained ground and the good priest escaped in the forest, where the revolutionaries hunted him like an animal. He took refuge in the hollow trunk of a tree, which entrance was concealed by a spider web and thus escaped certain death. As you would have guessed, this tree was our oak, which by then was already over 600 years old! 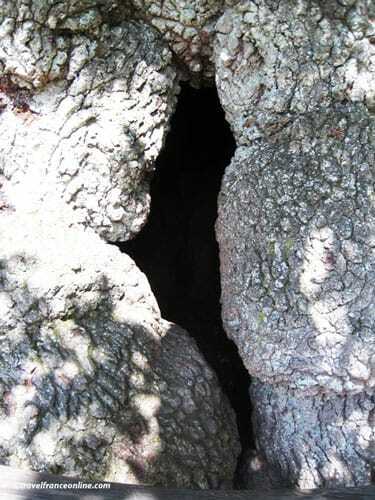 The cavity still exists but the entrance is obviously narrower. Who can doubt after such a story that the Forêt de Brocéliande is not a magical place? Visitor in search of magic, stop to greet the venerable tree and read the moving text of introduction written by Marc Beredjem on the information panel. Directions: From Concoret, follow the D141, you will find a small car park to the left of the road a couple of 100m after the place called Le Terte (it's signed).